The book introduction is exciting and the comments are interesting as well. Thanks for your guidence,it's a very big help for me and also to the other people.Im very curious to learn seo and i want to know that if we dont have a web site for practice practically. so,how can i get a real experience of your guidence.Please reply me soon,im eager to know your answer as soon as possible. I did not want to register. I thought that nothing of value here is not found. I was wrong. Found many interesting things. Thank you very much for the information. 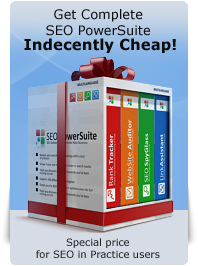 I love SEO Spyglass among the SEOPowersuite, it makes finding links so much easier. But I have to learn more in-depth about it. What I think is so awesome about learning SEO is not only will your own websites rise to the top of the search engines, but you can achieve the same for company websites and earn a lot of money from consultancy fees! So this is a subject I am passionate on, no-brainer! At last, i'd been waiting for a guy like you to spill it all out. I already started my site. It's on page 2 of google search. I am follow your seo guide , then improve the knowledege about SEO. Thanks a lot for this great work. Lots of people learn SEO like this kind of free books.